Every turn, all characters that have attacked will generate a new orb for themselves unless the enemy locks it or changes it. However, you can manipulate the orbs to your own benefit as well. Orbs are a very important part of the game. They determine how much damage you deal with a character. When the orb color matches your character's color, the character's damage is doubled when attacking. When your character has an orb that is their personal weakness (Force character with a Speed orb) that character's damage will be halved when attacking. Same-type orbs will be glowing radiantly. Weakness orbs will glow like a dying light bulb. All other orbs will be considered normal damage. Food orbs are also very important. It heals you based off of the total recovery value (RCV) of your crew. The trick, however, is that you can only heal with a food orb if you hit a GOOD or GREAT. PERFECT or MISS will result in wasting the orb. Sometimes, there's a special orb called Tandem which is a combo orb that triggers if you have all the required characters to perform the combo. They can do cool things like damage a bunch of enemies at once with fixed damage. Some bosses can manipulate your orbs with their special attacks. They can empty your orb slot which means you don't get any of the benefits or downsides to having an orb. A more annoying kind of manipulation is called the bother orb, which makes your character's attack deal half damage. - Doubles the attack of STR characters, halves for DEX. - Doubles the attack of DEX characters, halves for QCK. - Doubles the attack of QCK characters, halves for STR. - Doubles the attack of PSY characters, halves for INT. - Doubles the attack of INT characters, halves for PSY. [Meat] - Heals when hitting a GOOD or GREAT, does nothing if hitting a MISS or PERFECT. [empty] - Nothing. Boring, isn't it? [bother] - Halves your character's attack regardless of type. [tandem] - Requires certain characters to perform a special attack. It's not as great as it seems. The only useful one to date is a 5-man 2-star marine combo which deals 1,000 fixed damage to all enemies, which is great for clearing high defense turtles. Strong World Shanks: His captain ability greatly increases the chance of getting PSY orbs for all your characters, which is more reliable than it sounds. Towel Nami: Her special converts all PSY (her weakness) orbs to INT orbs which is essentially a 4x damage modifier. Trafalgar Law: Keeps all DEX orbs, and then randomizes the rest as DEX, MEAT, or TANDEM orbs. With Apu, this special goes from good to godly. Apu: Converts all MEAT and TANDEM orbs into DEX. Use this special with Law to have 6 DEX orbs. Doflamingo: Switch the position of two orbs twice, and doubles the effectiveness (damage) of orbs. You can make orbs match the characters and now the orbs do 4x damage. This is one of the best specials in the game. Aokiji: Boosts the ATK of Impact characters by 1.75x for 2 turns and locks all orbs for 2 turns. If you have the orbs you like, lock them with his special! Young Arlong: Converts Empty and Bother orbs to Force, and boosts orb effects by 1.25x for 2 turns. If there's a pesky boss that keeps emptying and ruining your orbs, bring them right back and smack the boss into oblivion! Can be used with Wapol, who empties all your orbs. Capone: Changes STR and DEX orbs into QCK orbs. Use with Khalifa, who changes all your orbs into either STR or DEX to have 6 QCK orbs. Gekko Moria: Changes STR and DEX orbs to INT. Can use with Khalifa for a big INT wombo combo. Khalifa: Changes all orbs into either STR or DEX orbs. Best used with Capone or Gekko Moria. 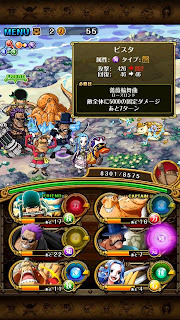 Garp: Changes all orbs into either PSY or MEAT orbs. Use with Mr. 2 to have 6 PSY orbs. Mr. 2: Changes all MEAT orbs into PSY orbs.